In other words when you purchase an AVE train ticket you are entitled to 2 free tickets (the equivalent of a return ticket) on the local commuter train network. You can use them to get to the station which the AVE departs from and from the station which the AVE arrives at to your final destination. What is the Combinado Cercanías? Renfe’s commuter rail service trains are called Cercanías. The Combinado Cercanías is a combined ticket offered by Renfe to every AVE or Long Distance passenger enabling you to get one Cercanías ticket FREE at either the origin or destination stations. Read the following examples if you still don’t get the pros. Example #1: You land at Madrid airport and you have an AVE train ticket to travel from Madrid to Barcelona on that same day. With the Combinado Cercanías you can get a free commuter train ticket to catch a train that will take you from Madrid airport to Atocha train station, where you will catch your high-speed train to Barcelona. Example #2: You are traveling on an AVE from Madrid to Barcelona. With the Combinado Cercanías you can get a free commuter train ticket to catch a train that will take you from Barcelona train station to the airport. When you receive (or print out) your AVE train ticket look for the words “Combinado Cercanías” followed by a sequence of numbers and letters. This 5 digit sequence of numbers and letters is the code that you use to claim your free commuter train ticket. Imagine that the code on your AVE train ticket is A4EXP. As soon as you get to the station where you will be catching your Cercanías train, follow these instructions to get your free ticket. Step #1: Go to a Renfe Cercanías vending machine. Step #2: Select your preferred language. Then, in the first screen select “Combinado Cercanías” at the top-left corner. Step #3: Scan your ticket’s QR code through the machine’s scanner as indicated in the screen. Step #4: In case the scanner does not work, you can always type the special code of your train ticket. If you still have problems to retrieve your Cercanías ticket, you can always go to a Cercanías ticket window. Please, bear in mind the following restrictions. You can start or end the journey at any of the Cercanías hubs listed below. Renfe: Asturias, Barcelona (Rodalíes), Girona (Rodalíes), Camp de Tarragona (Rodalíes), Bilbao, Cádiz, Madrid, Málaga, Murcia/Alicante, San Sebastián, Santander, Seville, Valencia and Zaragoza. Feve: Asturias, Santander, Cartagena and Bilbao. The ticket can be obtained and used three hours before departure at the station of origin and three hours after arrival at the destination station of the Long Distance-AVE train. 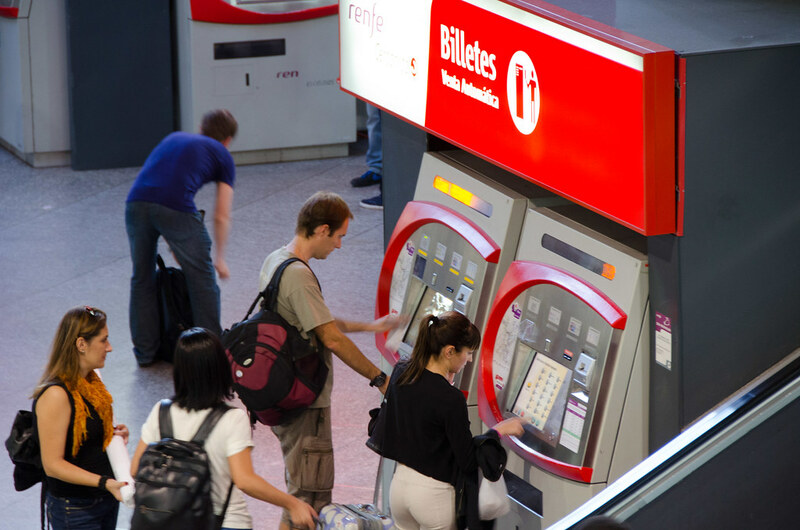 The special code assigned to your AVE or Long Distance train ticket allows you to print ONE Cercanías ticket. You can’t board the Cercanías train with your AVE ticket. You must claim your Cercanías train ticket from the ticket machines at the train station. Every Cercanías train has a conductor that checks everybody’s ticket and you risk being fined. You must keep your Cercanías ticket until you arrive at your final destination. You will need it to get through the ticket barriers when leaving the station. There is also a chance that ticket inspectors may ask to see your ticket.